In 1940 this commercial building was constructed with what was, probably at the time, a cool design; a bowed semi-circular roof adjacent to a flattop roof. The problem with this design came in mid January, 2016 when a record blizzard struck the region, resulting in over 30 inches of snow overnight. 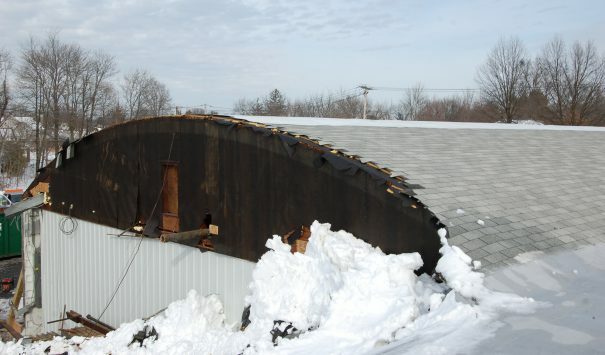 The resulting snowfall slid down the side of the bowed roof and accumulated at the intersection of the two roofs. 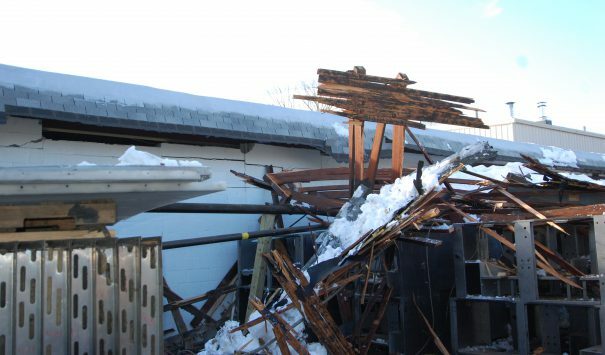 This increase in pressure on the support system resulted in a failure and ultimately a collapse of a 130 foot section of the bowed roof. 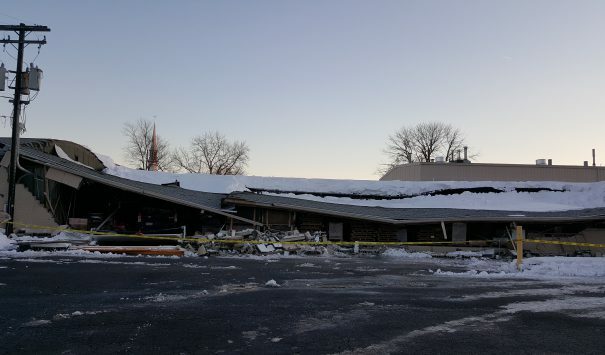 Post structural analysis found that, despite only snowing 3 feet in one night, the design of the roof redirected the snow that fell on the rounded roof onto the joint, resulting in an estimated 8 feet of snow in these areas. In technical terms, there was approximately 136 PSI of force on each of the joints. This drastic increase in pressure resulted in the failure. Thankfully no one was in the building at the time of the collapse. 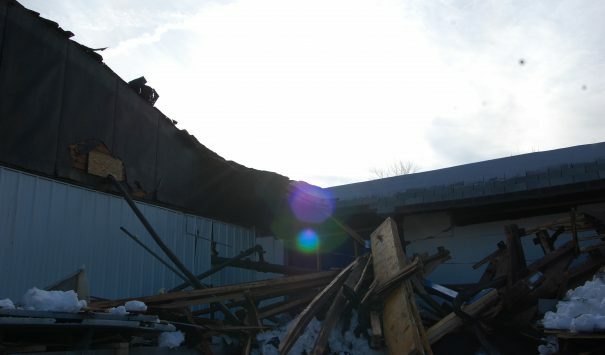 Cityline was hired to perform emergency services on the building and to clear the debris of the collapse. The first steps were to assess the damage in the adjoining buildings so that any steps taken would not further compromise the building and result in another collapse. 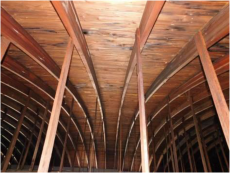 Working with the engineers at Plick and Associates, it was determined that because of the reverberations from the collapse and the snow accumulation on the rest of the roof that reinforcement of the structure would be vital to prevent further damage. It was also determined that the resulting displacement of piping nested in the ceiling was putting extra pressure on the truss system in the adjoining round-top building (a cross fit gym) and that it would be important to remove the piping before further damage was caused. 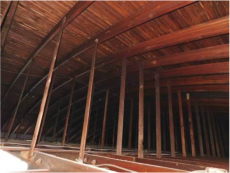 After estimating the repair work needed, Cityline found that this was a $100,000 claim. Our immediate, same day, response was to address all of these issuers. We worked with Jena Engineering to map out a structural support plan. 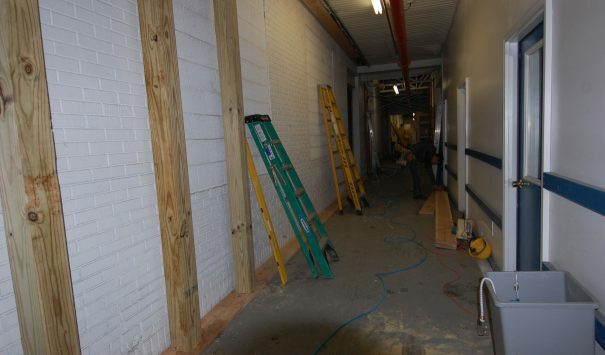 Together, we reinforced the rest of the building by constructing several supporting frames throughout to help reduce the pressure on the original structure of the building. 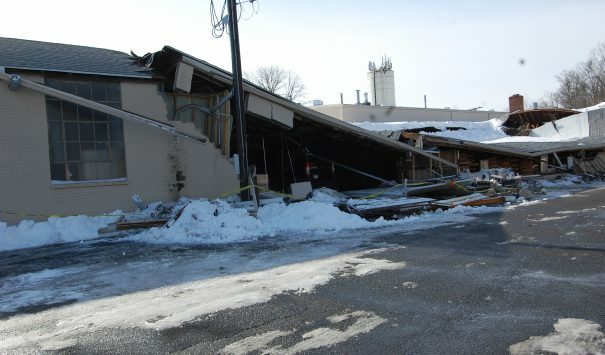 We also worked to remove the piping in the cross fit building being careful not to further damage the trusses. 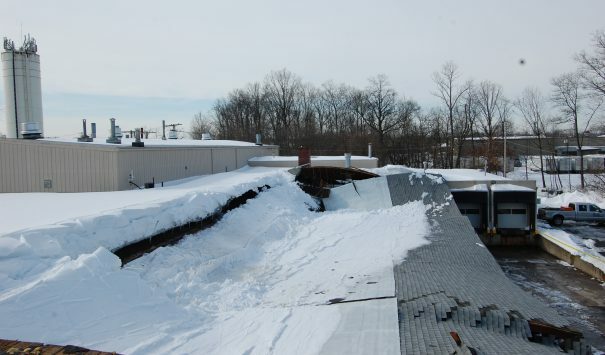 After reinforcing the structure, our field team went up to the roof to remove the accumulated snow and reduce the weight on the building. 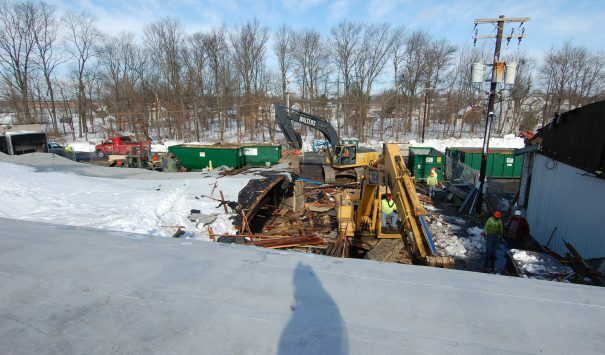 The next task was to tear down the collapsed part of the building and clear it out. While doing this we were able to salvage a trapped car and scissor lift. 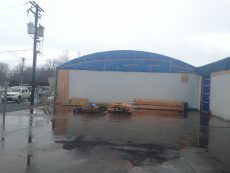 After clearing out completely the collapsed part of the building we patched up the connecting parts with plywood and tarps to prevent further damage. During their inspection the engineers found that the fire system was not only out of date, but it was also improperly hooked up. Most fire sprinklers within modern buildings work on a centralized system, and all systems are supposed to notify the fire department about the activation of the sprinklers and the location of the fire. 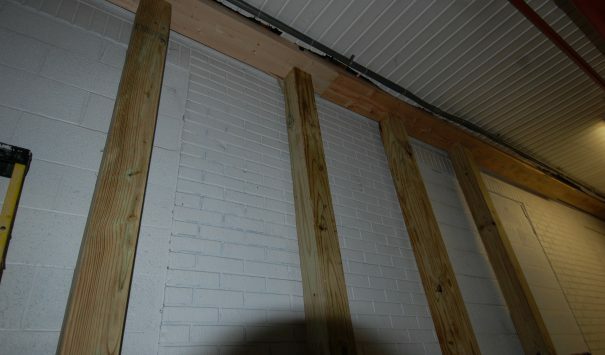 Along with reinforcing the building and removing debris it was important for us to update this system so it was up to code and that the next time the sprinklers went off the fire department would be notified. The building was allowed to reopen as long as we went to work on bringing the building up to code and assured the building was structurally sound; Cityline was able to do both of these. The sprinkler systems were brought up to code and Cityline made sure the building rest of the building was structurally sound. The property owners have not decided at this point where and when they are moving forward with reconstruction.